Google is asking a judge to delay a privacy lawsuit concerning email scans until after the Supreme Court decides whether consumers can sue in federal court regardless of whether they've been harmed financially. "It makes little sense to proceed with this case now, when the Supreme Court is poised to address this question," Google says in papers filed on Thursday with U.S. District Court Judge Lucy Koh in San Jose, California. Google's argument comes in response to a lawsuit brought in September by Daniel Matera, a San Francisco resident who says he doesn't have a Gmail account, but is forced to communicate with Gmail users due to the "ubiquity of Gmail." Matera alleges that Google violates the federal wiretap law and a California state privacy law by "intercepting" email messages in order to sell ads based on the messages' content. Google's terms of service currently disclose that it analyzes the contents of email messages for features including "tailored advertising." But Matera says that as a non-Gmail user, he never agreed to those terms. 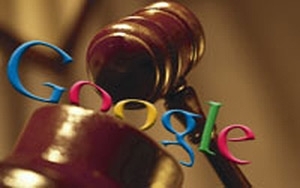 Google responded to the lawsuit on Thursday by filing motions asking Koh to dismiss the case outright or, alternatively, to stay the case pending the Supreme Court's decision in a lawsuit against online data aggregator Spokeo. The Supreme Court will hear arguments in the Spokeo matter on Monday, and is likely to issue a decision before July of next year. The Spokeo dispute dates to 2010, when Virginia resident Thomas Robins alleged that the site posted inaccurate biographical information about him -- including that he was in his 50s, married with children, and employed in a professional or technical field. Robins says that that Spokeo's report violates the Fair Credit Reporting Act, which requires credit reporting agencies to take steps to ensure the information they provide to potential employers is accurate. Spokeo argues that Robins shouldn't be able to bring a lawsuit unless he can first show that he was injured by any errors. A trial judge dismissed Robins' lawsuit, but the 9th Circuit Court of Appeals revived the case. Spokeo is now asking the Supreme Court to throw out the case. Google argues that the Supreme Court's decision could affect a broad swath of lawsuits by consumers, including the case brought by Matera. "A stay is necessary under these circumstances to prevent the parties and the Court from expending substantial efforts in litigation that may prove to be fruitless," Google says.